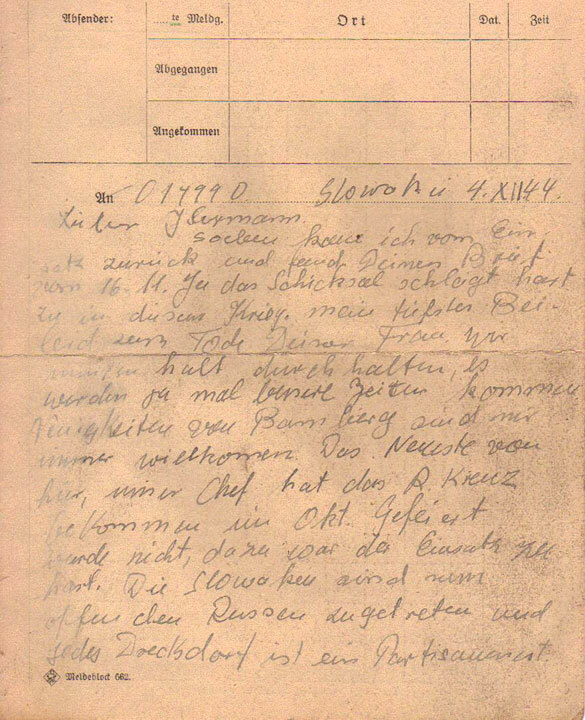 Sonderkommando Letter dated December 4, 1944. 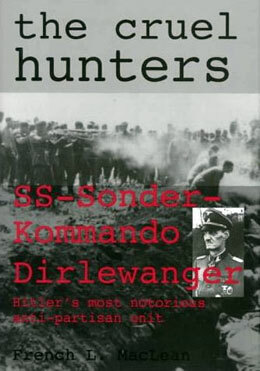 During the research for the book, I could not find a single living man, who would admit to serving with Dirlewanger. Over the last couple of years, however, I have come across a dozen letters, written by seven different soldiers in the unit. This one is from Franz, serving in SS-Sturmbrigade Dirlewanger; it was written one day after the brigade killed 136 partisans during the Slovak National Uprising. Franz may have been from Bamberg in Bavaria. It is not in the book, but is interesting; I have added the bracketed material in explanation. I just returned from an operation and found your letter from November 16. Yes, we all have to suffer in this war; my deepest condolences to you on the death of your wife. We just have to carry on until better times come. The news from Bamberg is always welcome here. The latest from here: our Chief [Dirlewanger] was awarded the Knights Cross in October [actually the date was September 30, 1944]; there were no celebrations here, the operations are too hard and there is no time for that. The Slovakians are now openly allied with the Russians and every dirty village is a nest of partisans. The forests and the mountains in the Tatra make the partisans a mortal danger. We make short work of any prisoners we take. Right now, I am in a village not far from Ipoliság [a small town, with a Hungarian population, in southern Slovakia just north of Budapest, Hungary.] The Russians are right at the gates. The replacements we just got are no good; it would be better if they were left back at the [concentration] camp. Yesterday twelve of them deserted to the Russians; these were all old communists; it would have been better if they had all been hanged on the gallows. But there are some real heroes here nevertheless. Well the enemy artillery is opening up again and I must end. Cordial greetings from your brother-in-law.